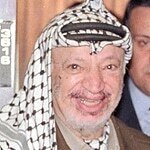 On 11 November 2004 Arafat, who had been critically ill, passed away in a military hospital in Paris at the age of 75. According to many Palestinians, he had been poisoned by Israel, and they felt their views were confirmed when the French authorities refused to release the autopsy report. Many thousands of Palestinians took to the streets when his body was flown to Ramallah by helicopter. He was buried in a sober mausoleum on the terrain of the Muqata’a. Both friend and foe agree that Yasser Arafat (Abu Ammar) was one of the historic leaders of the Palestinian national movement. Shortly afterwards, on 9 January 2005, presidential elections were held, this time boycotted only by Hamas and the Islamic Jihad. 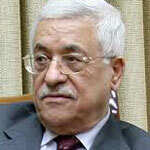 Of the seven candidates, the new leader of Fatah, Mahmoud Abbas (Abu Mazen) emerged victorious with 62.5 percent of the legitimate votes. However, due to the low turnout (43 percent; in 1996, the turnout was almost 72 percent), Abbas could only lay claim to the support of a quarter of the enfranchised Palestinian citizens. 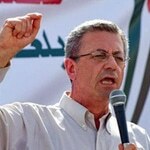 In second place, with 19.5 percent of the votes, came Mustafa Barghouti, who in 1979 was co-founder of one of the most important NGOs in Palestine, the Palestinian Medical Relief Society, a former leading figure in the (communist) Palestinian People’s Party (PPP) and afterwards leader of a new political movement, al-Mubadara (the Initiative). Candidates from two left-wing formations each won about 3 percent of the votes. 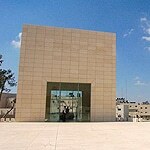 In that same year – shortly after Israel had withdrawn its troops and settlers from the Gaza Strip – the first municipal elections since ‘Oslo‘ took place. Hamas’ participation did not come as a surprise, as municipal elections had already been held before ‘Oslo’. Hamas was remarkably successful and obtained control over the town councils in various large towns, both in the Gaza Strip and in the West Bank. 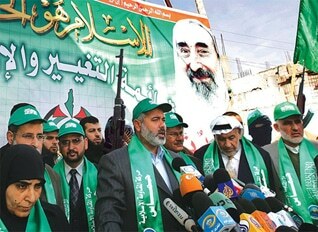 Undoubtedly partly as a result of its success, Hamas decided to enter the PLC elections for the first time. These were to be held on 25 January 2006 (although these elections were still inseparably tied to ‘Oslo’). With Fatah’s approval, the PLC election rules were modified. Firstly, the number of seats was increased from 88 to 132 (with six seats reserved for Christians). Furthermore, this time, a mixed system was maintained: half of the seats (66) were distributed among the various candidates based upon a national list and on the basis of the number of votes won; the remaining 66 seats, which were spread over 16 districts, were divided according to the constituency voting system. As a result of tight discipline within the Hamas ranks, in sharp contrast to increasing discord within Fatah, and the strongly growing opposition to PNA’s Oslo politics, which was dominated by Fatah, Hamas managed to win a large number of seats especially in the constituencies. With 74 out of a total of 132 seats, Hamas won an absolute majority in the PLC. Again, it was evident that the party enjoyed a large following not only in the Gaza Strip but also in the West Bank (including East Jerusalem). Fatah was the second largest party, with 45 seats. Three left-wing formations succeeded in winning seven seats in total. However, although there is nothing to be said against Hamas’ victory, the results give a distorted picture of the real balance of power. The difference in the number of votes was 30,000. There were 440,000 for Hamas and 410,000 for Fatah (respectively 44.5 and 41.4 percent). The turnout was around 75 percent. According to international observers, the elections were fair.